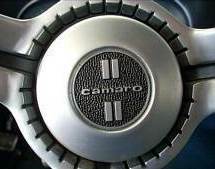 For the 1967 through 1969 Camaro, a multitude of selections were available to the consumer for even the most basic of automotive equipment. 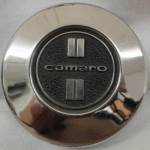 From seat covers and mirrors to engines and transmissions, deciding exactly how you wanted your Camaro configured could be an exasperating experience! Even seasoned sales staff had difficulty trying to figure out exactly what was, and was not, available on these cars. 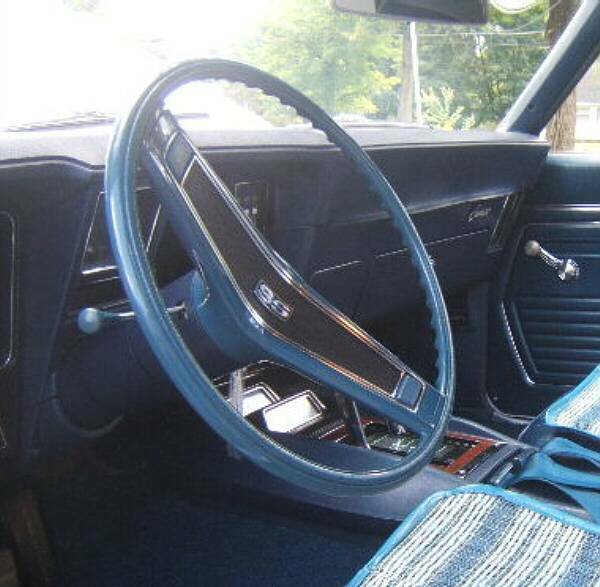 Selecting how you wanted your car to look wasn't simple and even the lowly steering wheel didn't escape the confusion. 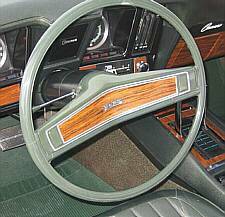 There were standard steering wheels, custom interior steering wheels, optional deluxe steering wheels, and simulated wood steering wheels. With so many factory options, plus changes that owners have made over the years, it can be difficult to figure out how the cars were originally configured. 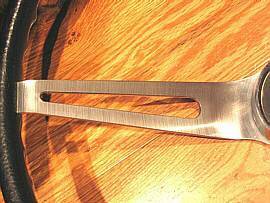 Let's see if we can straighten it out for you! 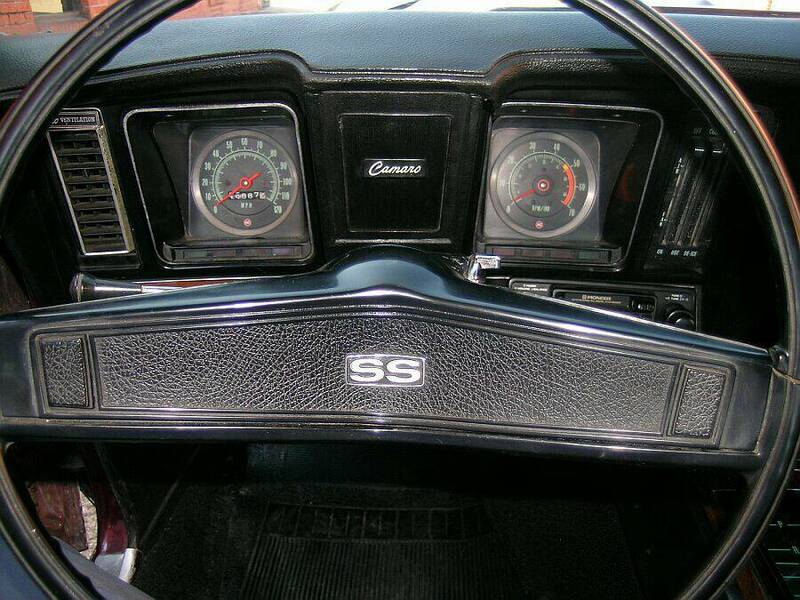 At least with regard to the steering wheels. 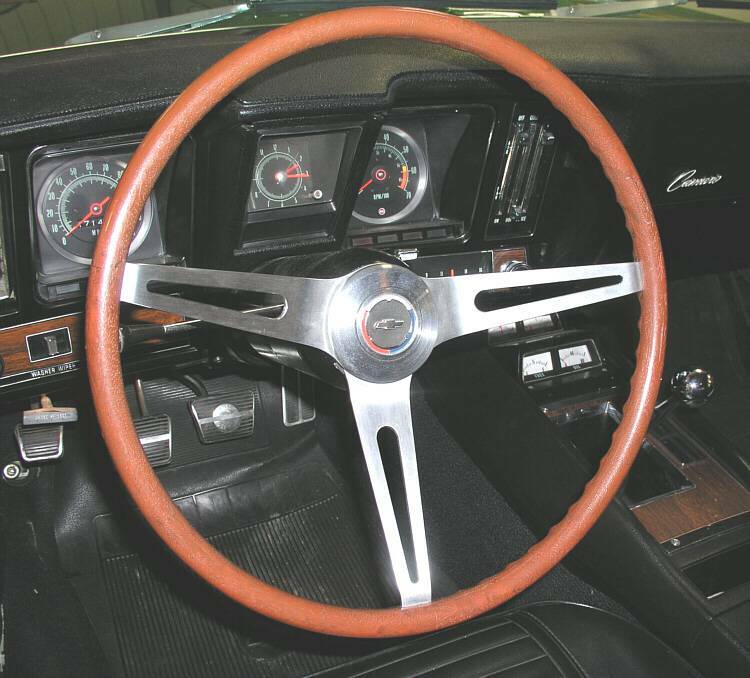 Note: Several first generation Camaro steering wheels were shared with other Chevrolet and GM models. 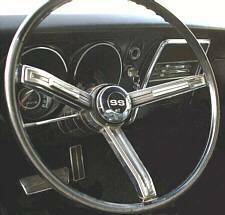 Although some interchange information is included below, there are other references 1 available that contain more exact details on 1960's steering wheel interchangeability. 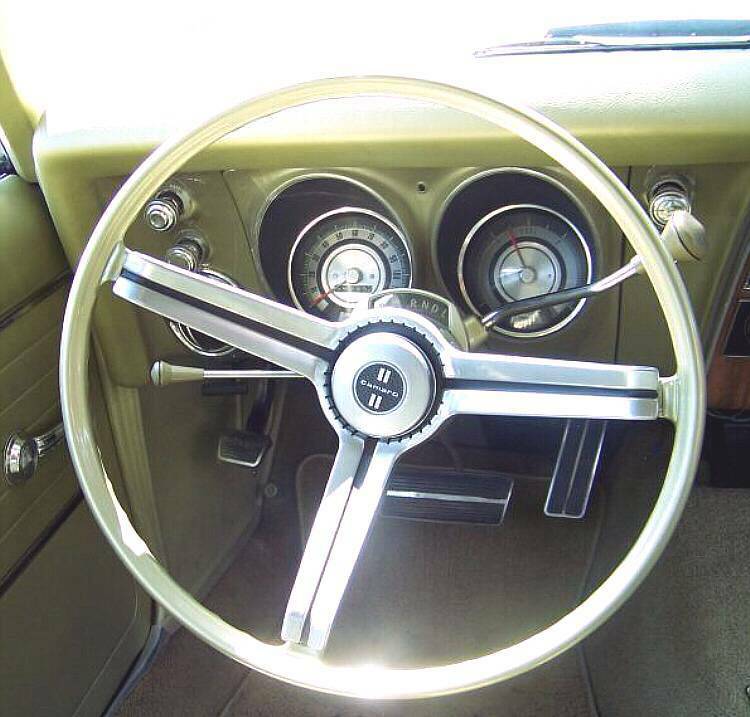 For 1967, four steering wheels were available in a variety of colors. 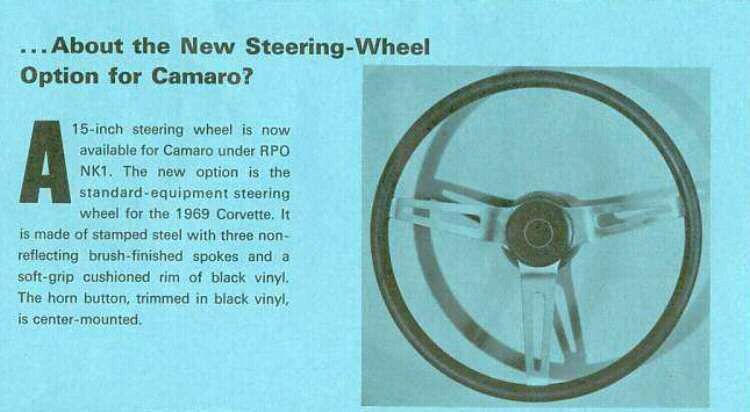 The first was the standard steering wheel, included in the purchase price of every Camaro. 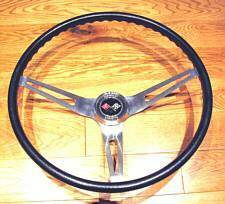 This was a three-spoke, molded plastic wheel with a chromed, round center horn button. Very basic to say the least. Next was the steering wheel included in the RPO Z87 custom interior. 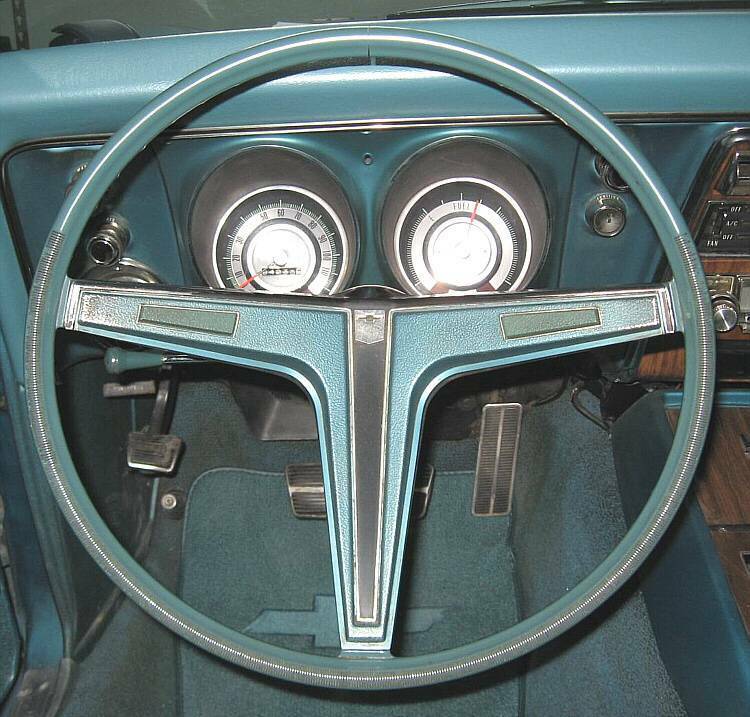 This was the same as the standard steering wheel, but with an additional T-shaped bright metal trim piece that covered the spokes of the wheel and a different base "Camaro" horn cap. 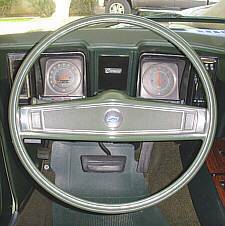 Four different horn caps were used with the standard steering wheel and the custom interior steering wheel. 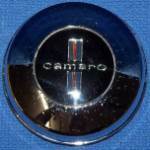 For base, Z28, and SS396 cars, the standard "Camaro" horn button was used. The standard steering wheel used a chromed horn cap with "Camaro" cast into it. The custom interior steering wheel used a chromed horn cap with a plastic "Camaro" insert. 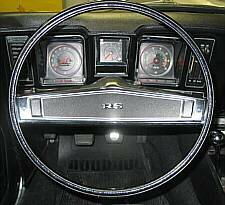 SS350 models received the "SS-350" horn button, and RPO Z22 Rally Sport cars received the "RS" horn button. 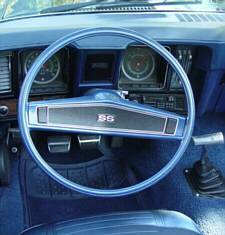 If the car was equipped with both the Z28 and RS options, the "RS" cap was used. 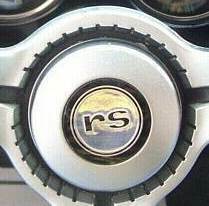 If the car was equipped with both the RS and SS350 options, the "SS-350" cap was used. Whereas if the car was equipped with both the RS and SS396 options, the standard "Camaro" cap was used. A much nicer "deluxe" steering wheel was available as RPO N30. 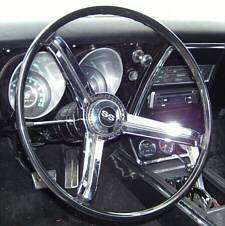 The deluxe steering wheel was optional with either the standard interior or the RPO Z87 custom interior. 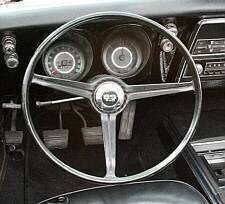 The same steering wheel was standard on the 1967 Chevrolet full-sized cars (Impala, Caprice, Bel Air, and Biscayne). 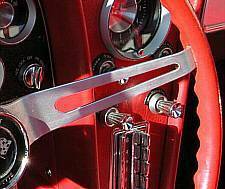 It included ribbing on the lower 2/3's of the wheel for grip and two rectangular horn buttons incorporated into the T-shaped bright metal trim. 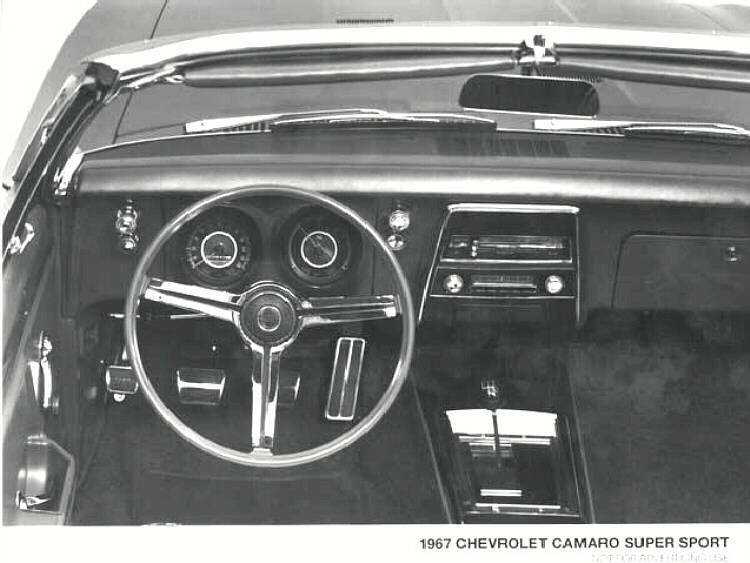 It had a horn cap with the Chevrolet "Bow Tie" emblem in the center, even if the car was equipped with the Super Sport or Rally Sport options. 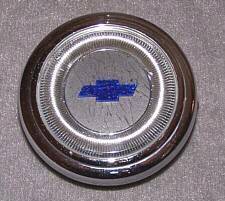 The chrome horn caps for this wheel were the same for the Chevelle, Impala, and Camaro models with only the center emblem being different for each. 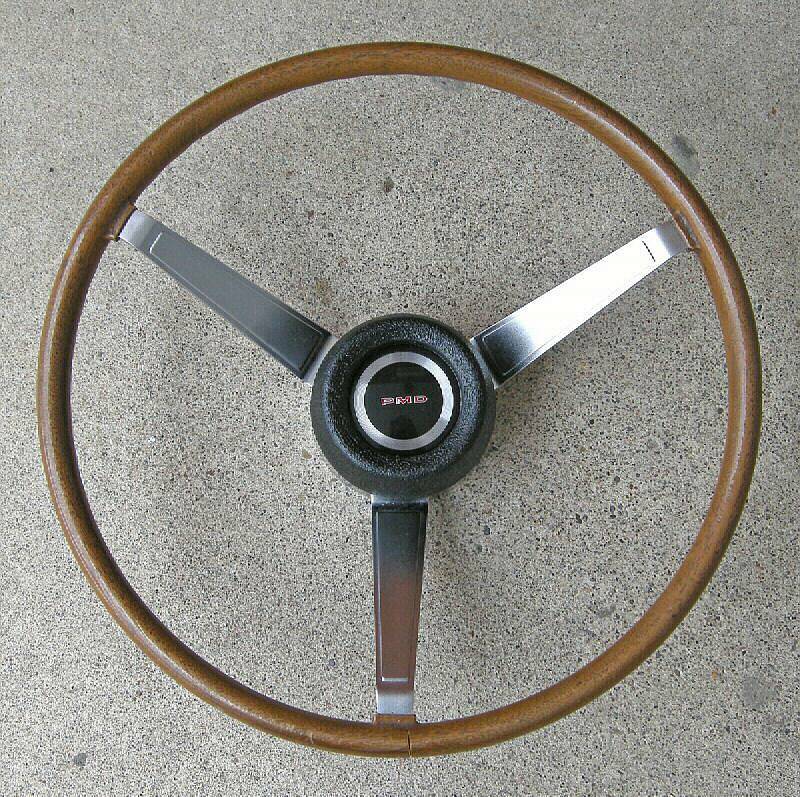 Finally, the RPO N34 Sport Styled, simulated walnut, wood-grained plastic steering wheel was an option. 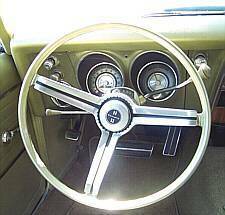 For 1967, this wheel was available on any Chevrolet car (and standard on the 1967 Corvette), regardless of interior styling, and gave a look of sportiness and elegance to the interior. 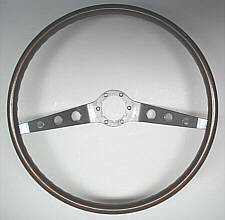 This steering wheel was 16 inches in diameter, had a 4 inch "dish" (the perpendicular distance from the mounting surface to the wheel), and was textured like an actual wood steering wheel . 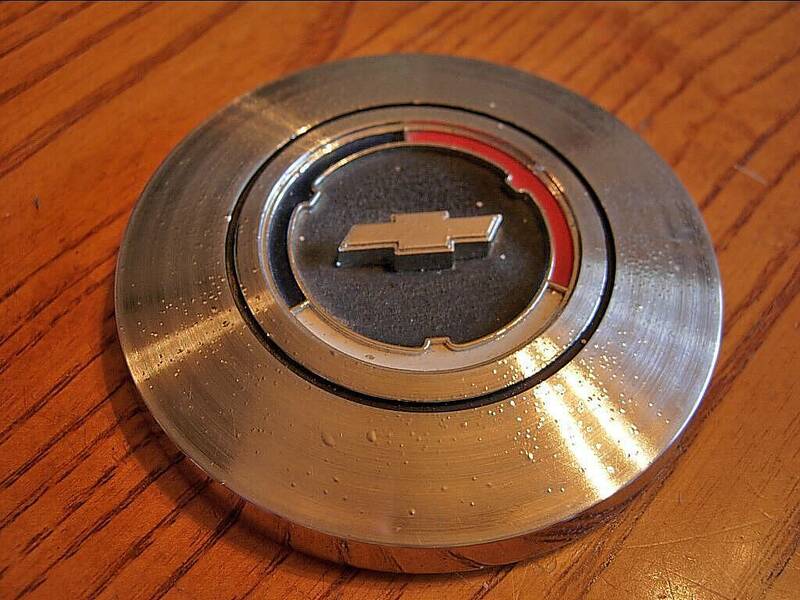 It included three brushed metal spokes and a brushed horn cap with the Chevrolet "Bow Tie" emblem in the center 2. 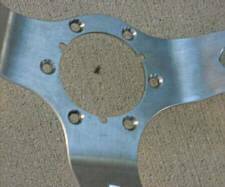 The spokes were a two-piece design and overlapped at the center, requiring the correct hub with a cut-out for the wheel to fit correctly. 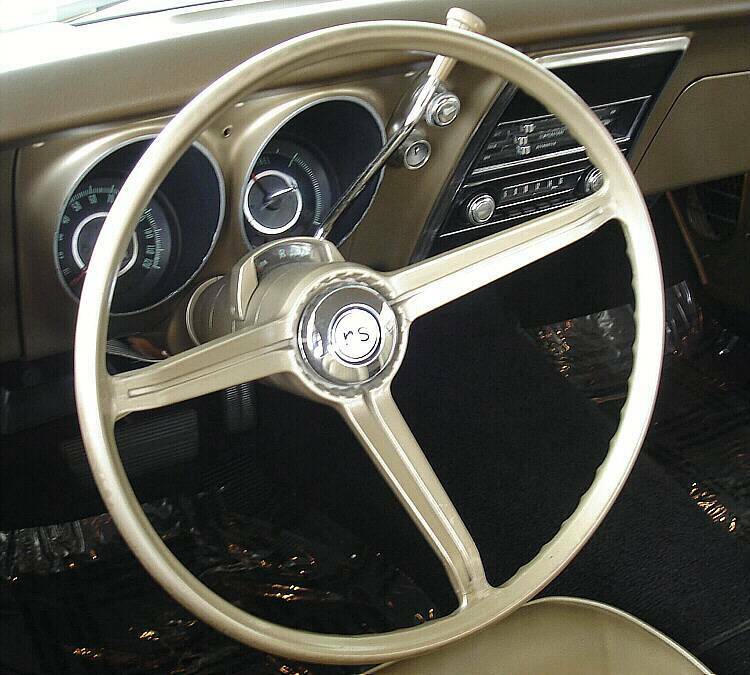 This differed from the 1963 through 1966 Corvette wheel, which had the same dish as the Camaro but used a one piece flat spoke design with no overlap and attached to a hub without the cut-out. Also note that to be correct, the horn cap should be positioned so the white painted section is at the top, not the red and blue sections. In 1968, ordering was made easier with only three steering wheels available. Leading the list was the standard steering wheel, which was similar to the 1967 RPO Z87 custom interior steering wheel. 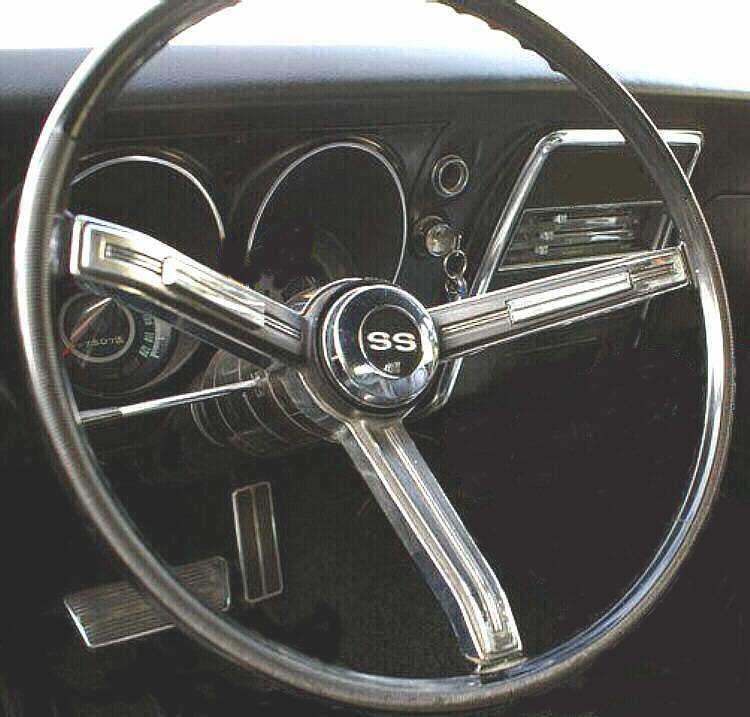 It used the same wheel, trim design, and horn caps, but due to reflective surface laws that were enacted for 1968, the trim and horn caps now had a brushed or matte finish instead of bright chrome. 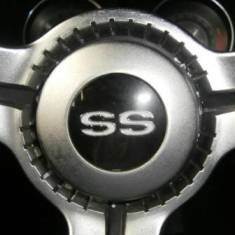 Three horn caps were available, with the standard "Camaro" cap on the base and RPO Z28 models, the "SS" cap on all Super Sport models, and the "RS" cap on the RPO Z22 Rally Sport equipped models. 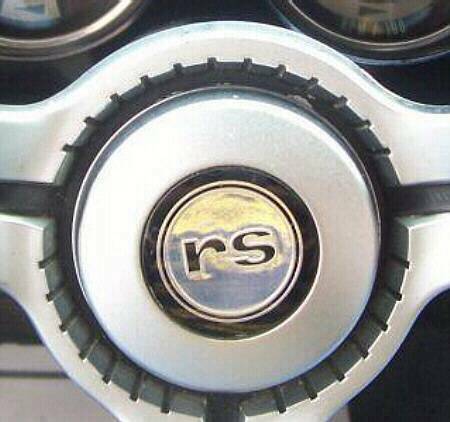 If the car was equipped with both RS and SS, the "SS" cap was used. 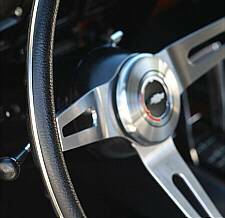 The Rally Sport "RS" cap was used on Rally Sport Z28's. Next on the list was the RPO N30 deluxe steering wheel. 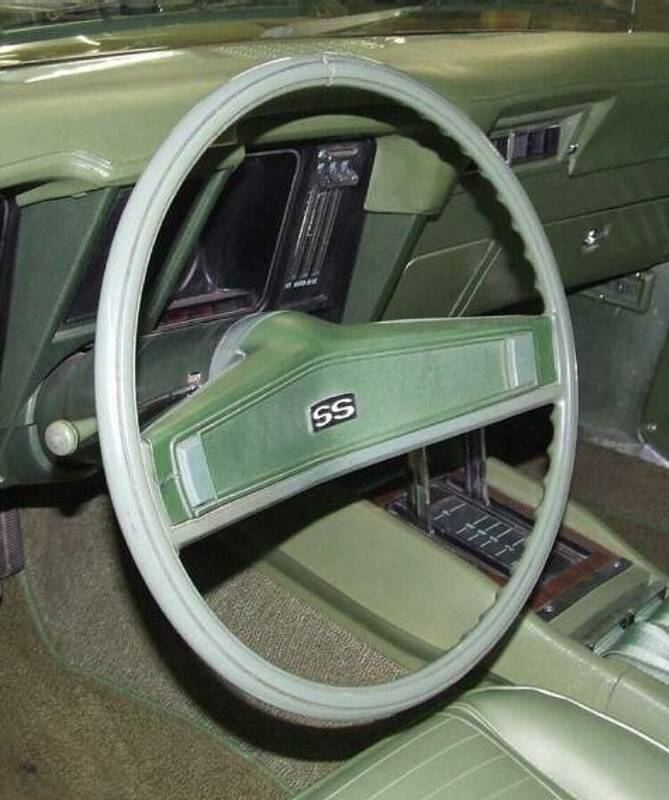 This was a completely different steering wheel than prior Camaro wheels. 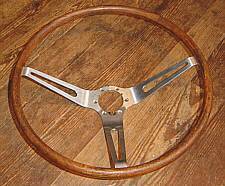 It included ribbing on the lower 2/3's of the wheel for grip and a T-shaped painted metal shroud with two rectangular horn buttons. The N30 wheel was available as a stand-alone option for standard interior cars and was included with RPO Z23 special interior or RPO Z87 custom interior options. 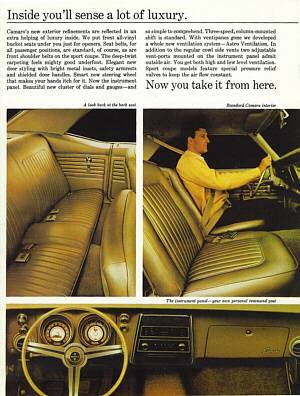 It was also used in the 1968 Chevrolet full-sized cars, Chevelles, and Novas. 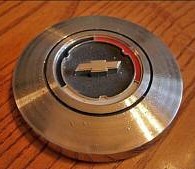 A Chevrolet "Bow-Tie" emblem was placed in the center of the N30 shroud for base, Rally Sport, and Z28 models, while Super Sport models received an "SS" emblem. Two versions of this wheel were used with the first having black accents on the upper and center portions of the shroud, and the later versions without the black accents. Although the exact date of this change isn't known, it appears to have been sometime in February 1968. 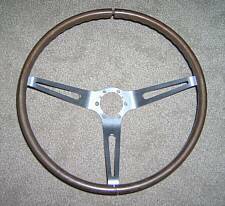 Finally, the RPO N34 simulated walnut, wood-grained plastic wheel was carried over from the previous year and was available on any Chevrolet car (and standard on the 1968 Corvette). 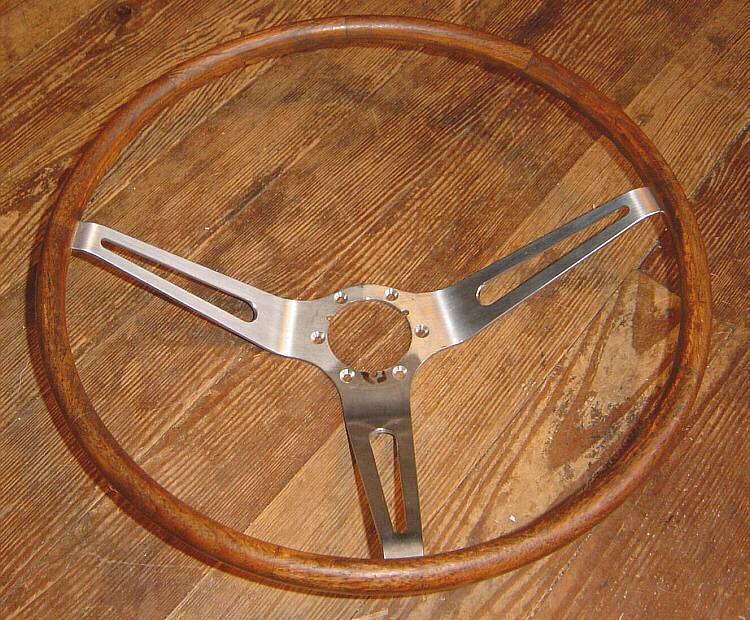 As in 1967, the wheel was textured (woodgrain detail pictures are shown in the 67 section), and the spokes were a two piece design and overlapped at the center, requiring the correct hub with a cut-out for the wheel to fit correctly. 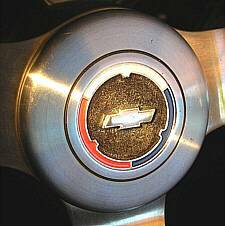 The only horn cap available with the N34 wood-grained wheel was the brushed cap with the Chevrolet "Bow-Tie" emblem 2. The 1969 standard steering wheel was a completely new design than the previous two years and had only two spokes instead of three. 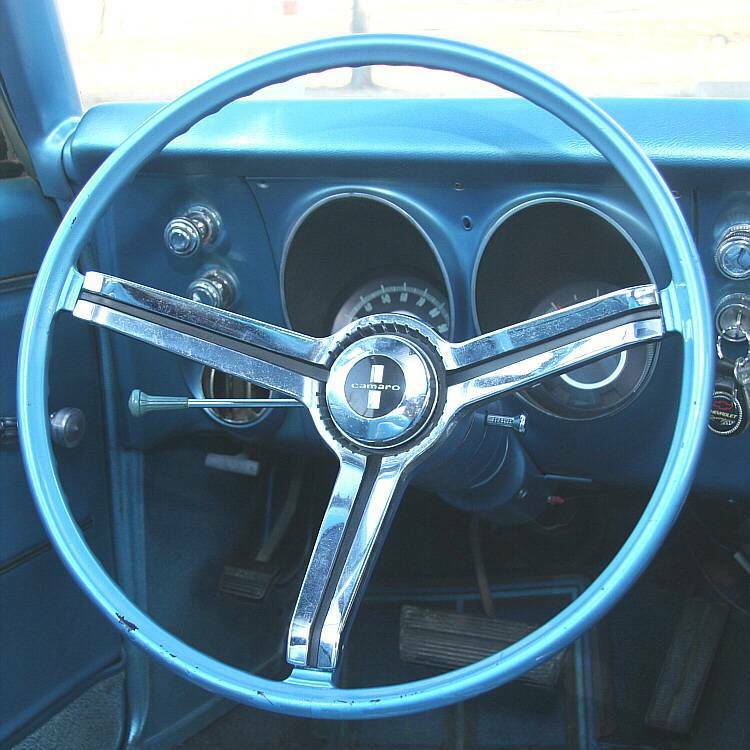 The wheel was shared with the Chevrolet full-sized cars, Chevelles, and Novas. 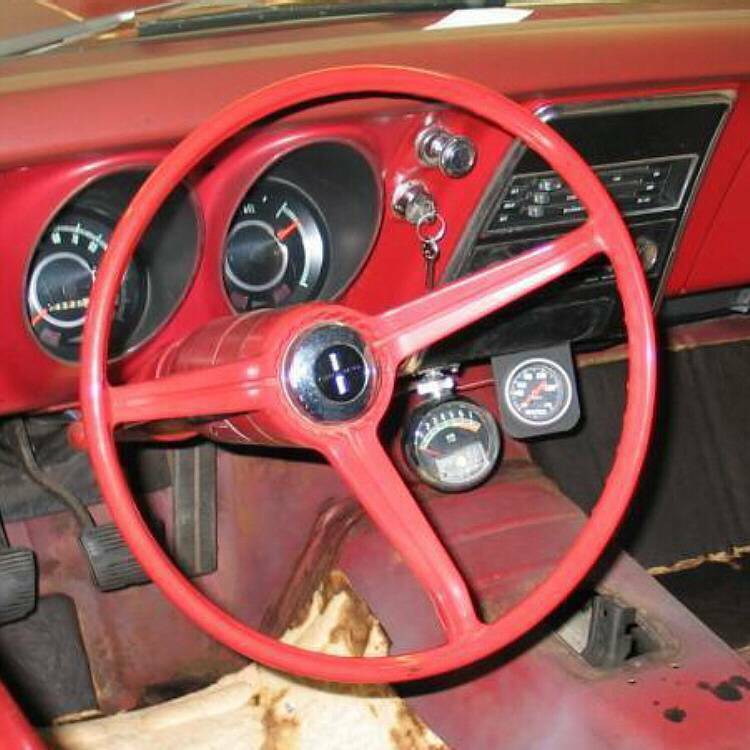 The steering wheel shroud was color matched plastic with two rectangular horn buttons, instead of the metal shroud of previous years. 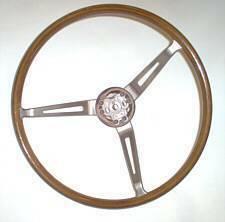 There were two slightly different versions of this wheel. 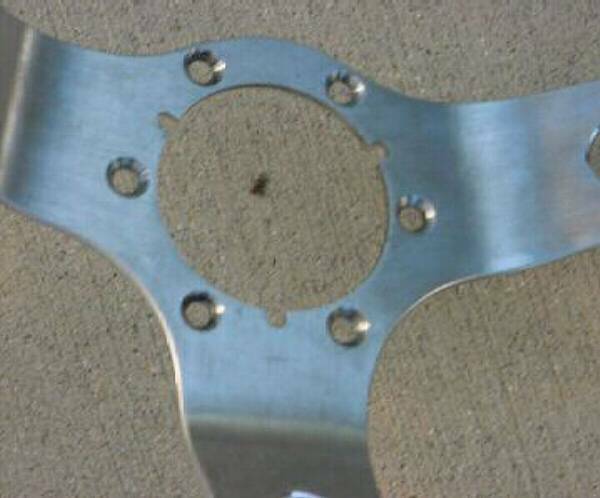 The front of the rim had grooves molded into the circumference about 1/2" apart. 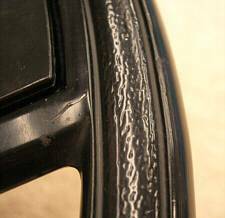 One version was "pebble-grained" between the grooves and the second (and later service replacement wheels) were "smooth" between the grooves. It appears that both versions were used interchangeably throughout the production year. 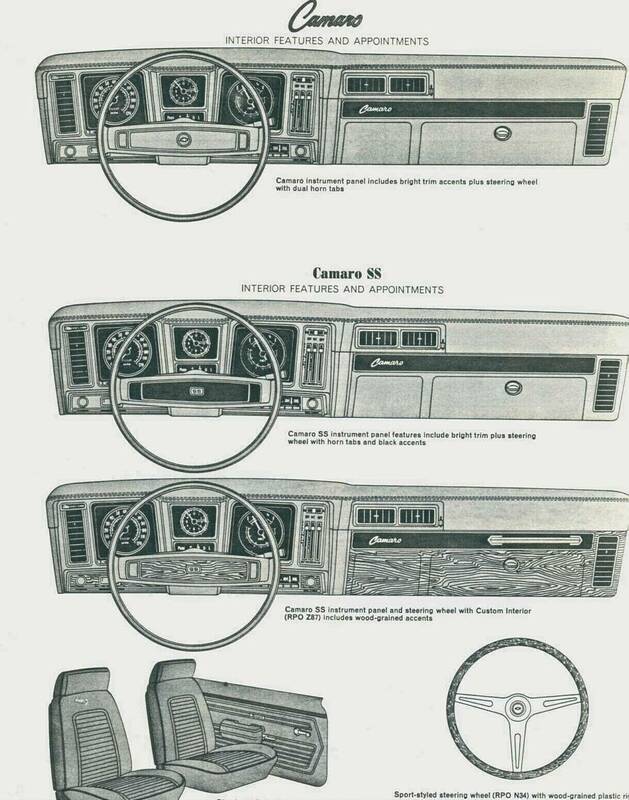 Also note that although a "deluxe steering wheel" (RPO N30) is referenced in the early literature packages (and in the Parts and Accessories Manual below), this wheel was never offered in production. 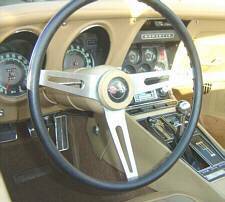 Standard interior cars received a color matched pebble-grained facing on the shroud while RPO Z23 special interior and RPO Z87 custom interior cars had a wood-grained accent that covered the pebble graining. 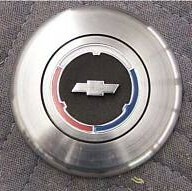 A center "Bow-Tie" emblem was included with base, COPO, and Z28 models, while an "RS" emblem was installed with cars equipped with the RPO Z22 Rally Sport option. 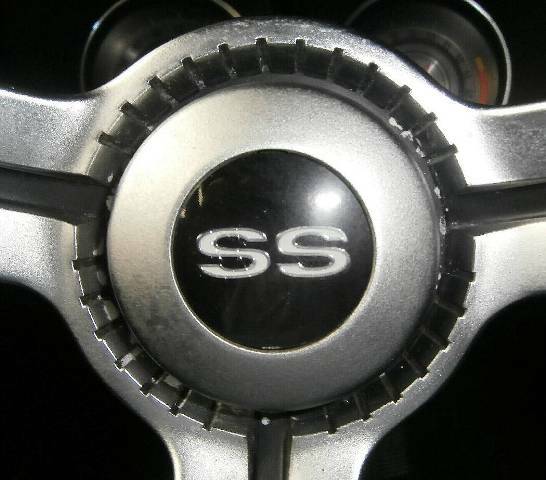 Super Sport models received an "SS" emblem and, as before, the "SS" emblem overrode the "RS" emblem if the car was equipped with both options. 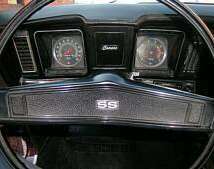 Also, like before, if the car was equipped with the combination Z28 and Rally Sport options, the "RS" emblem was utilized. Note that on some early Camaro SS models with red, green, or blue interiors, the pebble-grained facing on the horn shroud was black instead of color matched, as shown on page 7 of the 1969 Camaro Dealers Sales Album (left). This appears to have been done for the first part of 1969 production. 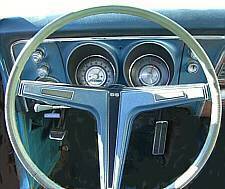 Also note that in these instances, the horn buttons have been observed in both black and color matched. 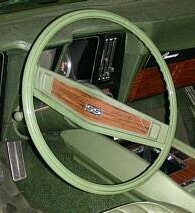 As an upgrade, the RPO N34 simulated wood-grained, plastic wheel was available. As in 1967 and 1968, the wheel was textured (woodgrain detail pictures are shown in the 67 section),	and the spokes were a two piece design and overlapped at the center, requiring the correct hub with a cut-out for the wheel to fit correctly. 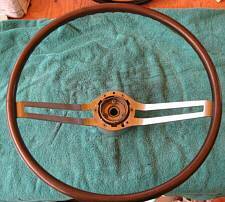 However, this wheel had a much shallower dish, only 2.5" depth, than the 67 and 68 wheel. 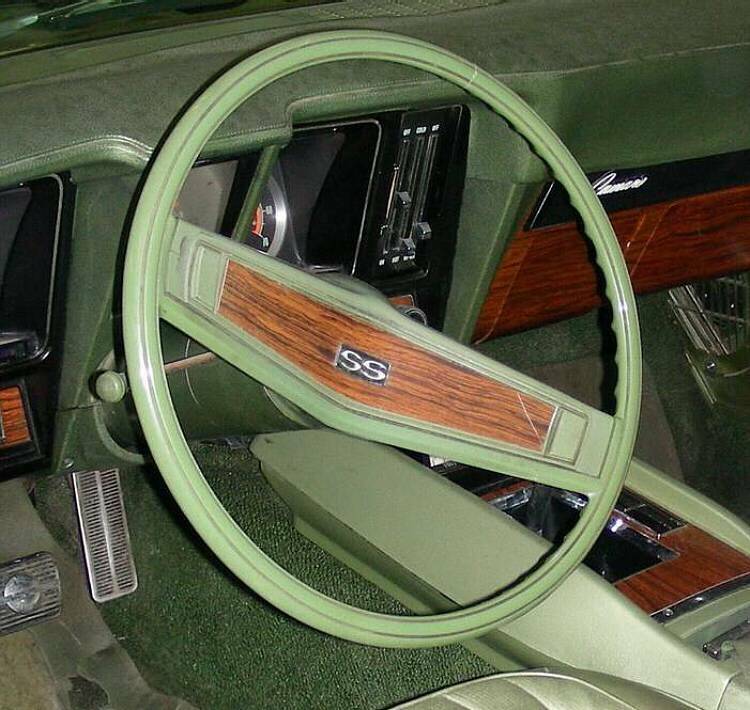 There were two versions of the 69 N34 wheel. 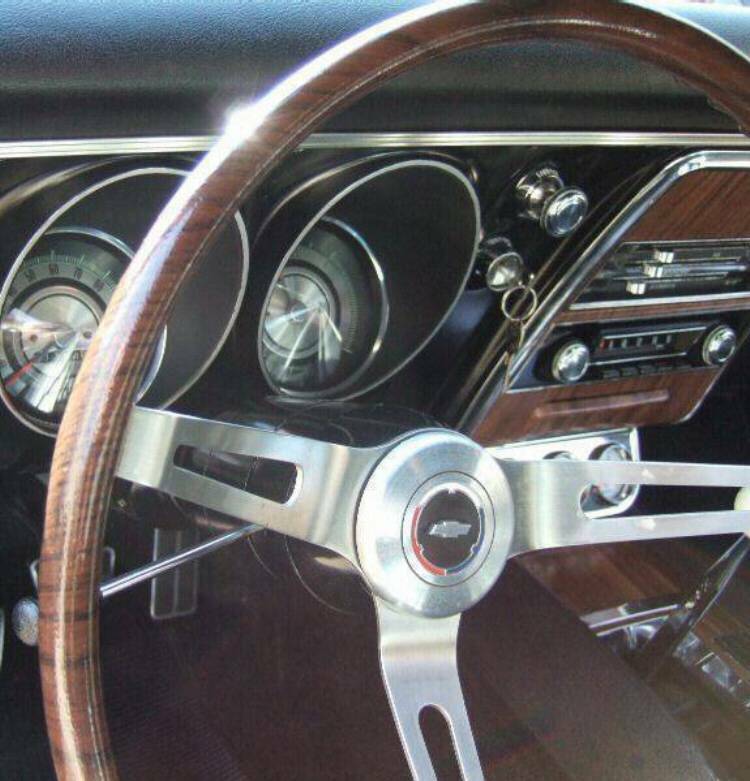 The walnut version was only used for the first few months of production and is considered rare. Starting in late November 1968, the rosewood version of the wheel was introduced. It was dimensionally the same as the earlier walnut version, but it was now simulated rosewood to match the wood-grained trim on the instrument panel. 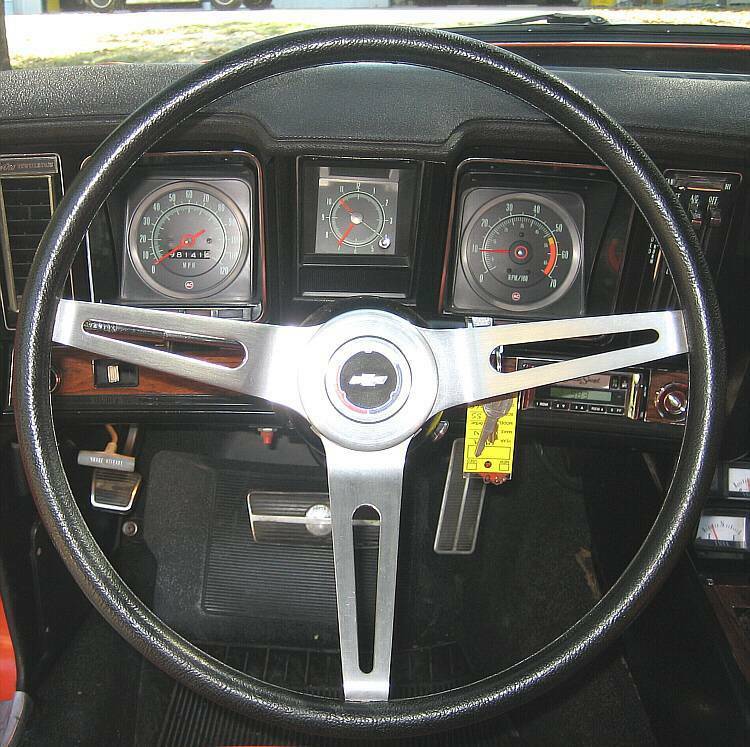 The RPO NK1 "Cushioned Rim" steering wheel was introduced in the April 1969 dealer information (right), however the factory production totals indicate that no 1969 Camaro came equipped with this wheel. 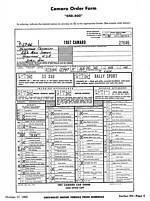 Recently, a car with window sticker documentation has been discovered that has NK1 and there is also a Canadian documented car with NK1. 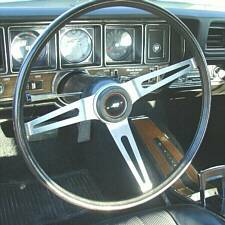 The 15" NK1 steering wheel was standard on the 1969 through 1975 Corvette, optional on the 1969 Camaro, 1970 Chevelle, Monte Carlo, and full-size passenger cars, and optional on the 1971 through 1975 Buick GS. While being the same basic design as the 1969 wood-grained steering wheel, the NK1 instead used a textured, hard vinyl outer coating with a stainless steel metal band around the perimeter. 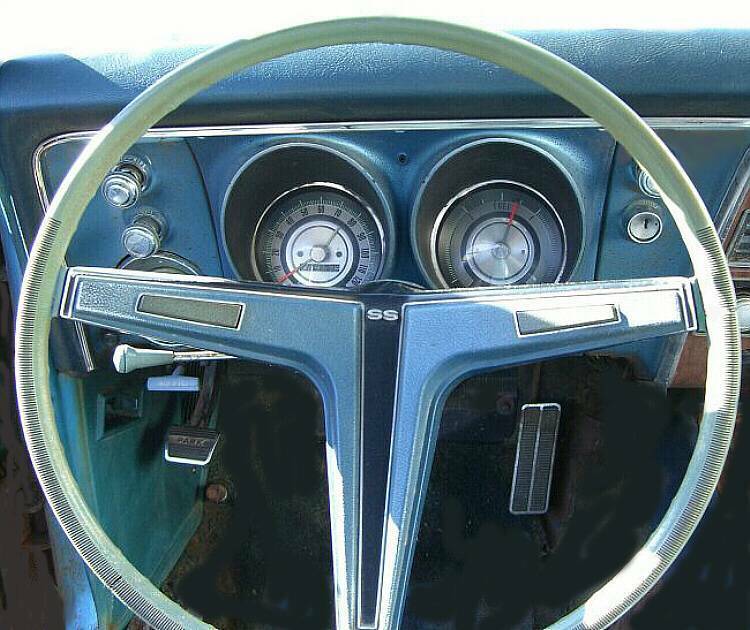 It's interesting to note that although this steering wheel was available in several colors for the Buick, the Chevrolet version of the wheel was only available in black! 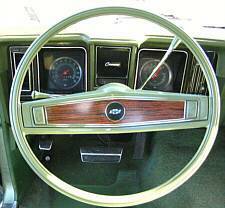 Also note that while Chevrolet referred to this wheel as the "Cushioned Rim" steering wheel, Buick referred to it as the "Rallye" steering wheel. 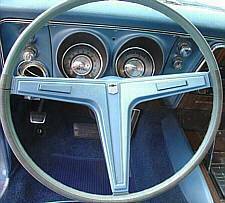 It's also incorrectly referred to as the "Comfort Grip" steering wheel. 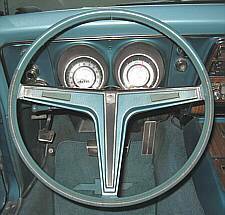 This mistake most likely began because of the Chevrolet naming convention of the RPO N33 "Comfortilt", tilt steering column. 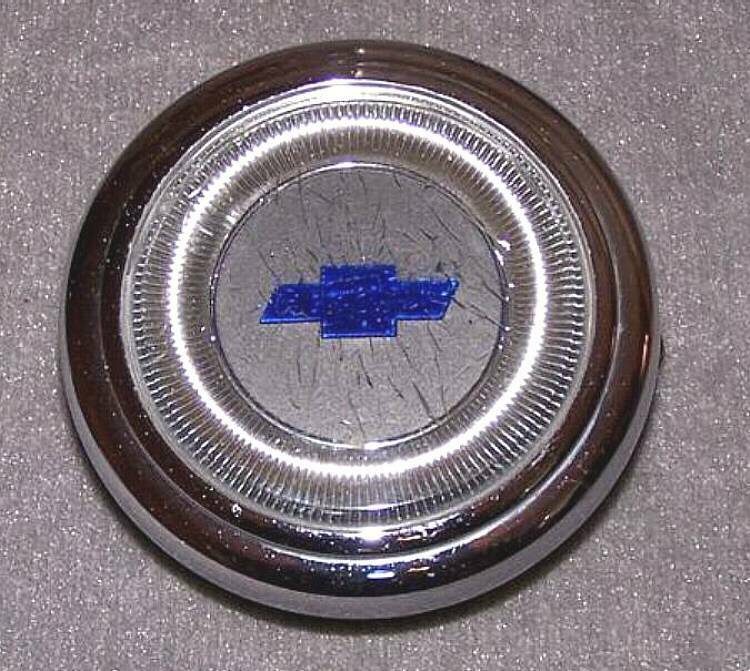 As in the previous two years, the only horn cap available on the N34 wood-grained wheels (and the NK1 cushioned rim wheel) was the brushed cap with the Chevrolet "Bow-Tie" emblem 2. 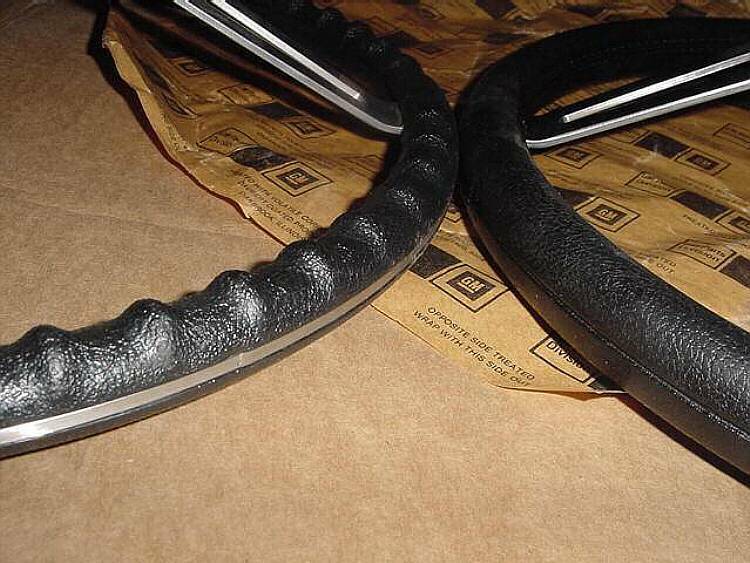 (The NK1 information sheet indicates it used a black vinyl horn cap, but there is no evidence it was used in production.) 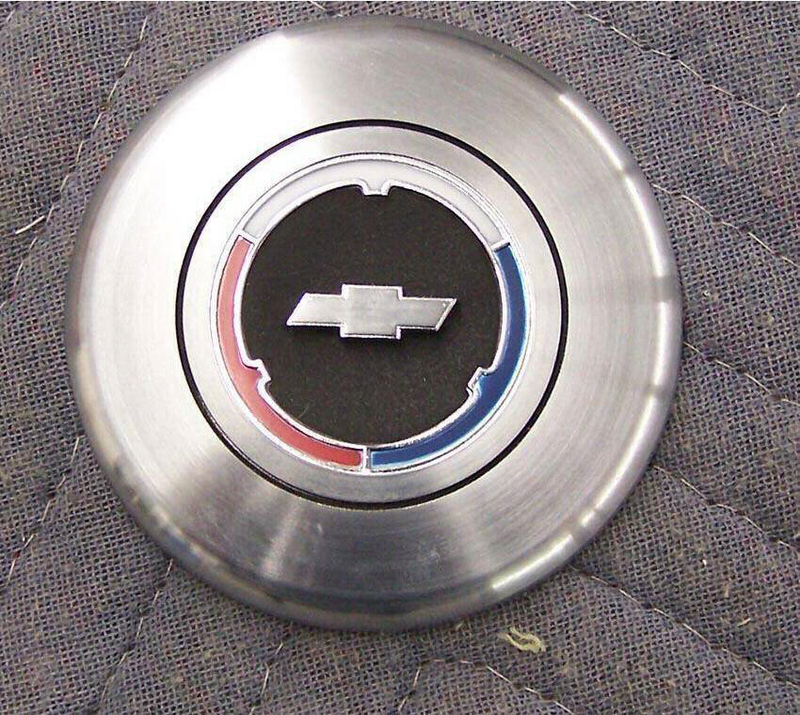 The horn cap should be positioned so the white painted section is at the top, not the red and blue sections. 1. 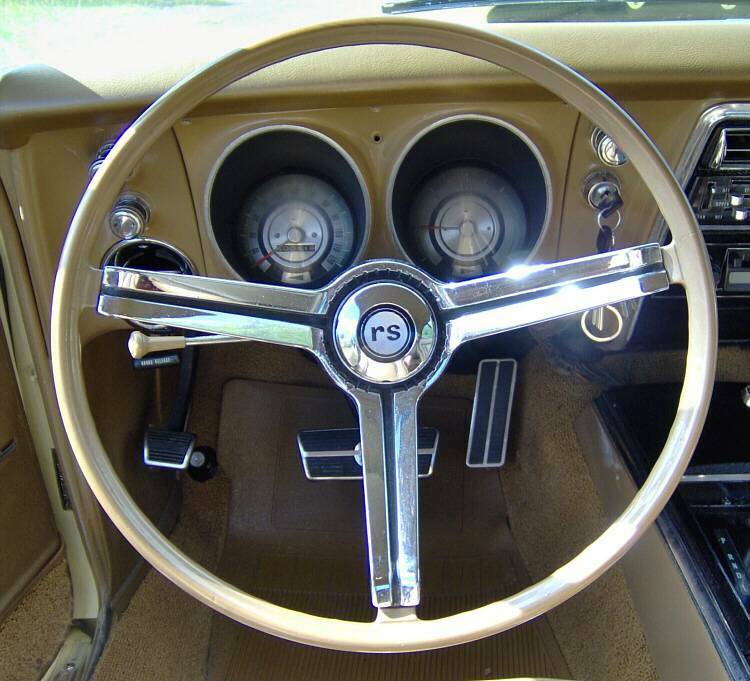 As stated above, the 1967 through 1968 Chevrolet simulated walnut steering wheel (optional on all carlines including Camaro and standard on the Corvette) was very similar to the 1963 through 1966 Corvette simulated walnut steering wheel with the exception of the spokes and corresponding mounting hub. 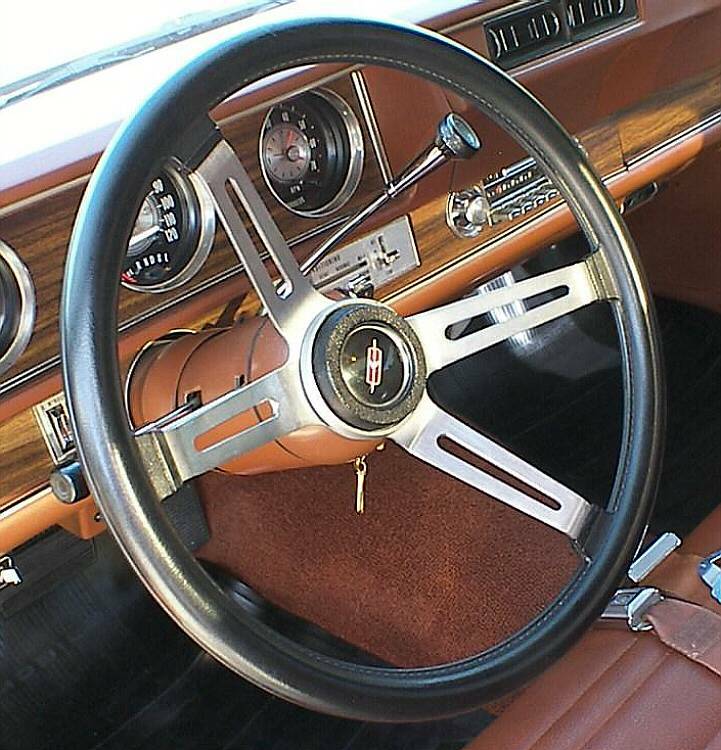 The 1963-66 Corvette simulated walnut wheel utilized a one-piece spoke design while the 67-68 wood wheel utilized a two-piece overlapping design. 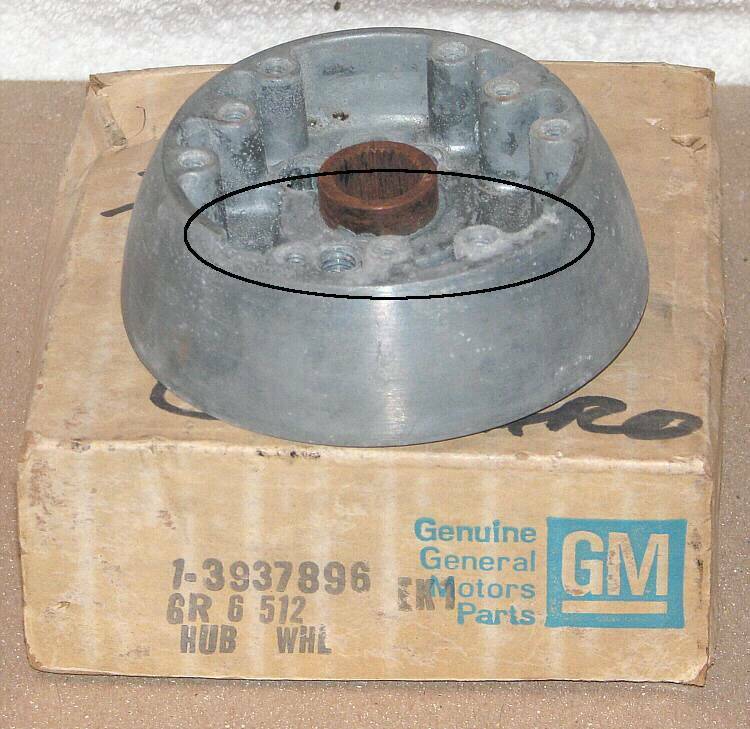 The 1963-66 Corvette mounting hub had no cut-out while the 1967-69 Camaro hub had a cut-out. 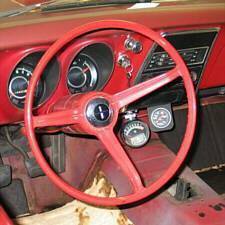 Worth mentioning are two other early Corvette steering wheels. 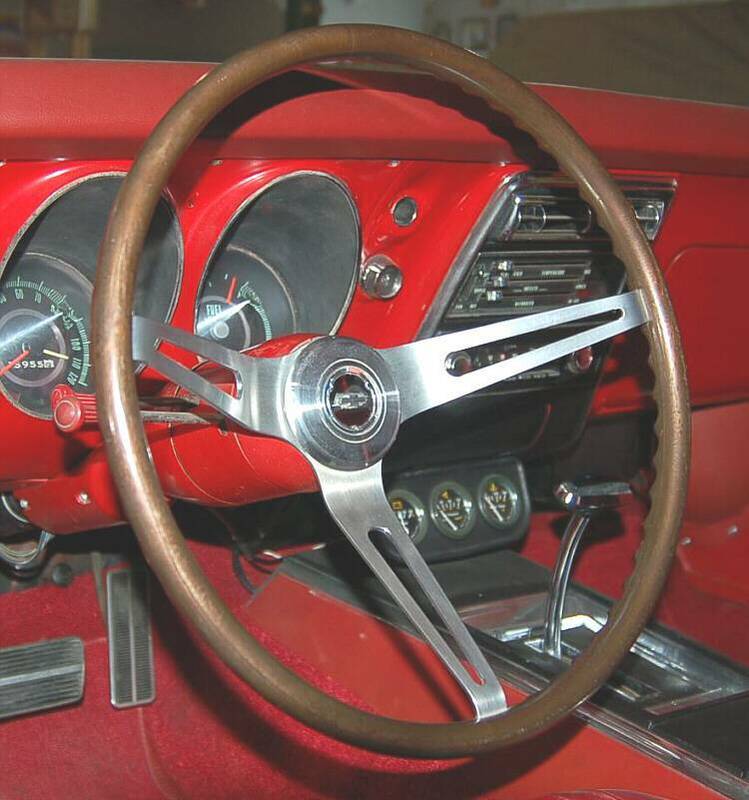 The 1963 three spoke wheel (with early versions using a "circular" pattern on the spokes and a "radial" pattern like the Camaro after June, 1963), and the 1965 through 1966 Corvette optional teak wood wheel. The 1963 Corvette wheel was color matched to correspond to the interior of the car, and the 1965 though 1966 teak wheel was manufactured from actual teak wood, which was laminated over the circular metal bar. 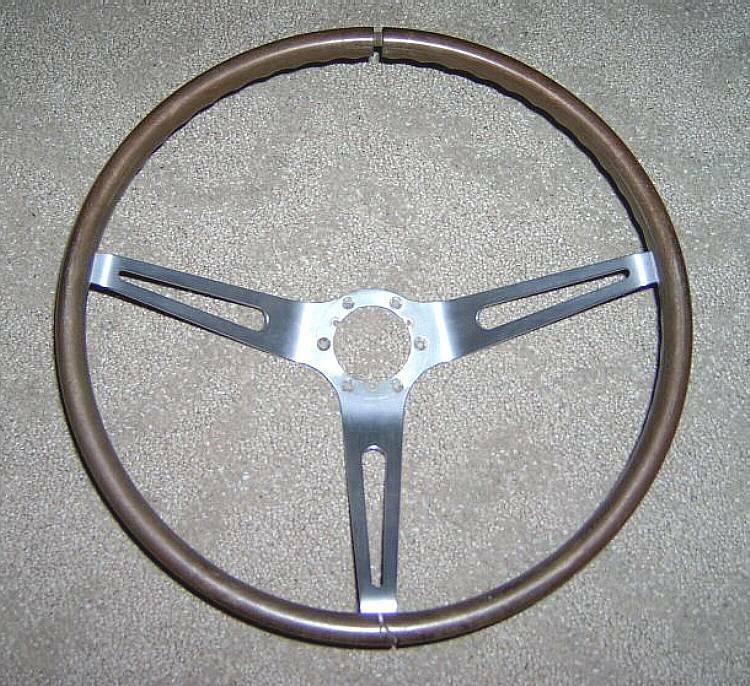 Both of these used the same one-piece spoke design as the 1963 through 1966 Corvette simulated walnut wheel. 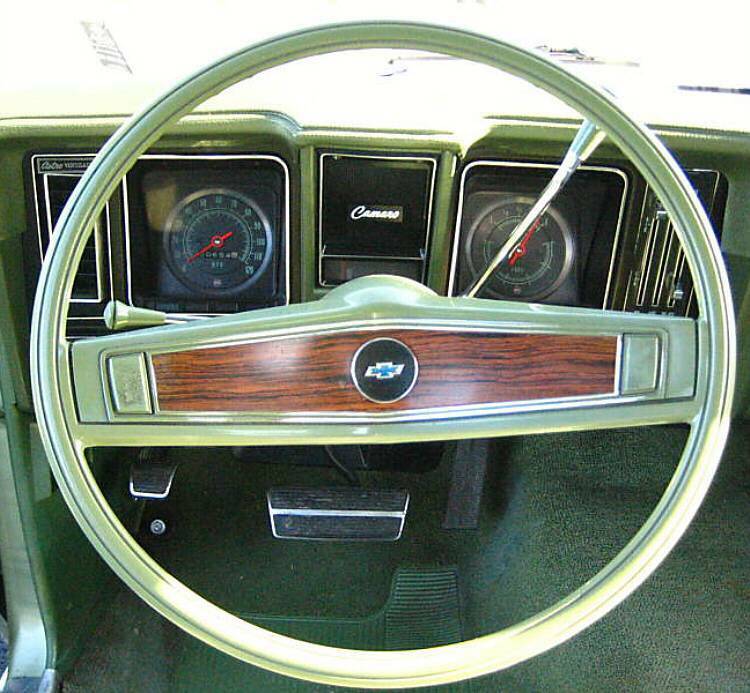 There were other simulated walnut steering wheels used by GM. 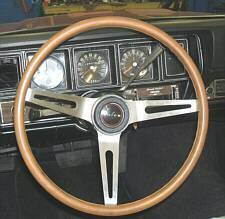 The 1964-66 Chevrolet models (other than Corvette) and the 1964-66 Buick used a two spoke simulated walnut steering wheel. 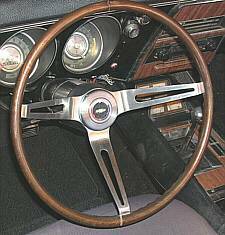 The late 1960's Pontiac wheel and the late 1960's Opel Kadett wheel were both the three spoke simulated walnut steering wheels. While the two spoke wheels and the Pontiac wheel are very different in appearance to the 1967-69 Camaro N34 steering wheels, the Opel wheel is very similar. 2. 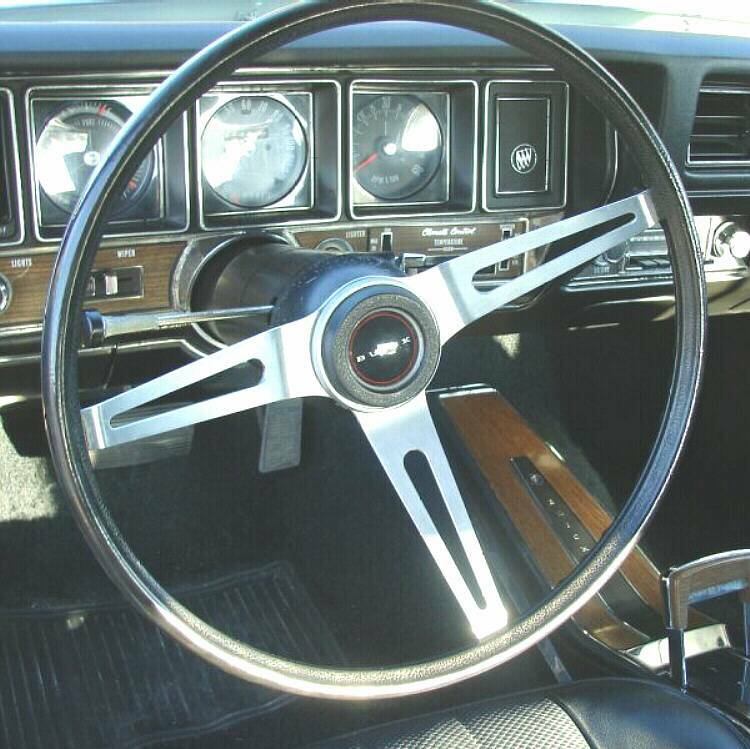 The optional three spoke steering wheel for the 1969 and 1970 Buick GS was similar in appearance to the NK1 cushioned rim steering wheel and the 1971 through 1975 Buick GS Rallye wheel. But the 1969 and 1970 Buick GS wheel was 16" in diameter instead of 15", was offered in a variety of colors to match the interior, was made of hard plastic instead of hard vinyl, and included a thumb groove for comfort. In fact, this steering wheel is commonly referred to as the "Thumb Groove" steering wheel in Buick circles. 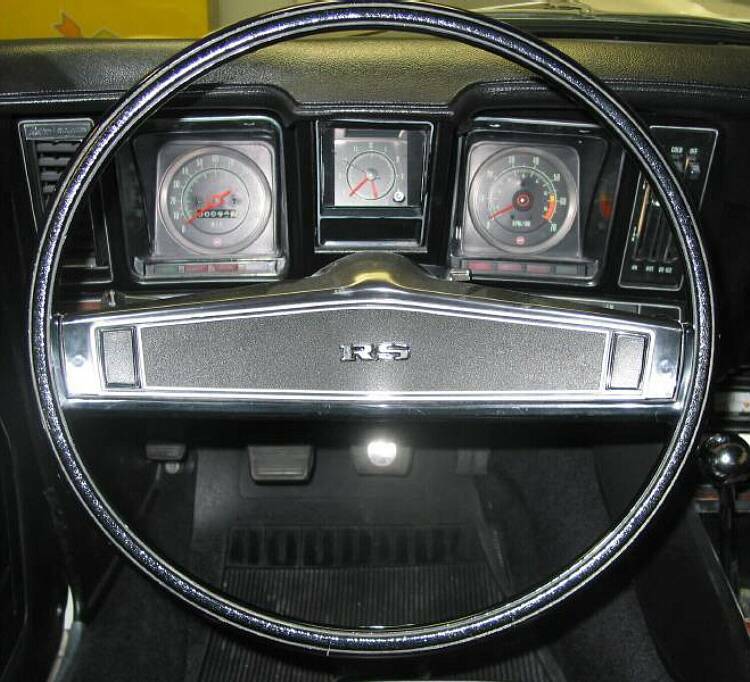 Also note that the 1970 Buick GSX "Custom" steering wheel is similar in appearance to the the NK1 Cushioned Rim wheel and the 1971 through 1975 Buick GS Rallye wheel. 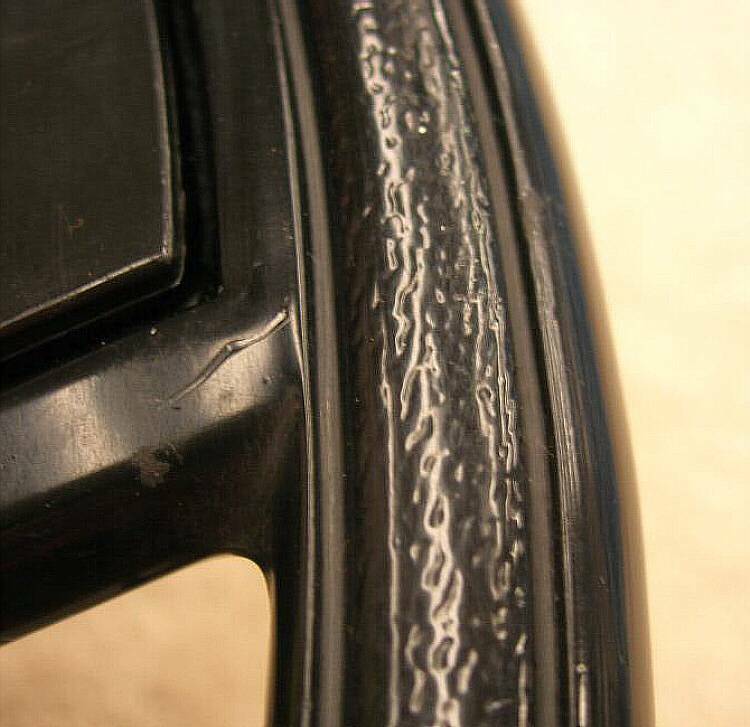 However, this wheel used a softer foam rubber grip, had different graining, and did not have the metal band around the perimeter like the other steering wheels. 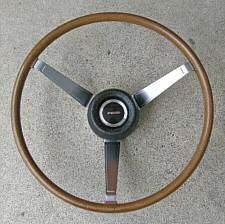 Like the 1969 NK1 wheel, this steering wheel was only offered in black. 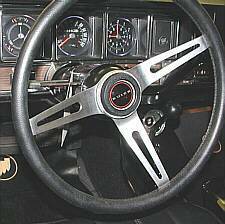 It's interesting to note that because Don Yenko especially liked this wheel, he made it available on the 1970 Yenko "Deuce" Nova. 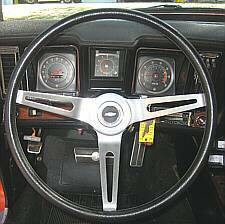 Finally worth mentioning are the two versions of the "Sport Grip" steering wheels used optionally on the 1970's Olds 442 and Olds Cutlass, and the 1970's Olds Omega and Olds Starfire. 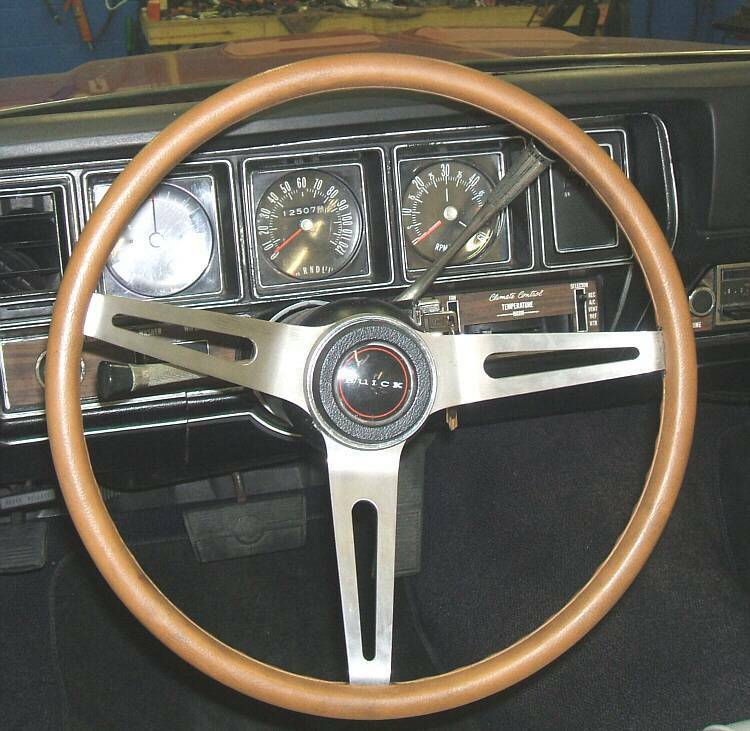 These steering wheels used the same soft foam rubber without the metal perimeter band as on the 1970 Buick GSX "Custom" steering wheel, but were of a four spoke design instead of three and were only 14" in diameter. The 1970's Olds Omega and Olds Starfire wheel was decorated with faux threading cast into the grip and was offered in several colors to match the interior; the 1970's Olds 442 and Olds Cutlass wheel only came in black and was fairly plain. 3. 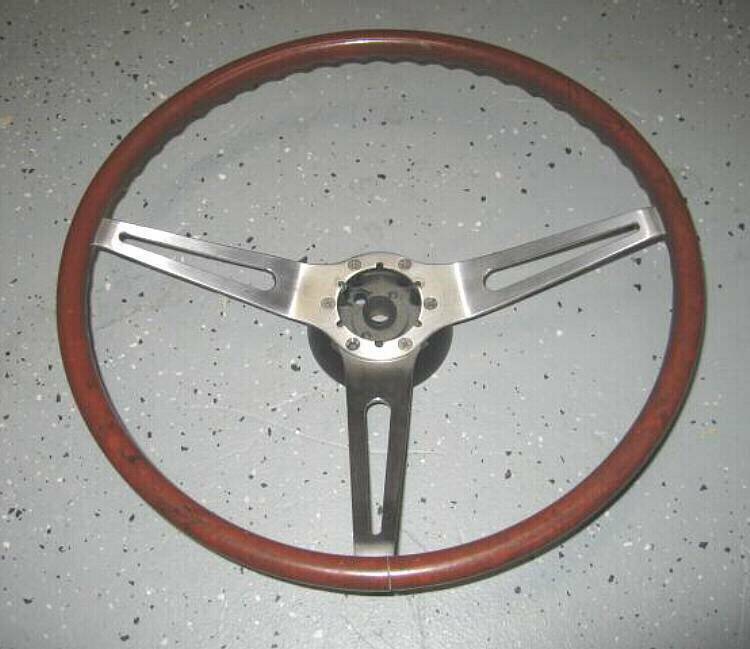 As of this writing, the reproduction walnut-grained steering wheels for 1967-1968 (and early 1969) are easy to detect since the graining is completely different than originals. 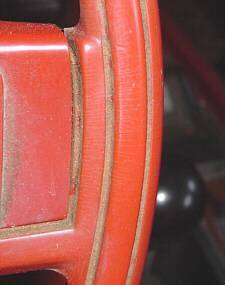 However, eventually these reproductions will probably get better, and they may become very difficult to discern from the originals. 4. 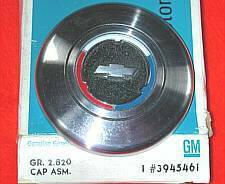 Note the difference between the 1964-1966 Chevrolet pot metal wood wheel horn cap, as opposed to the 1967-1969 stamped steel wood wheel horn cap (below). 5. 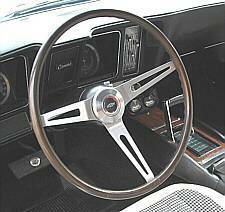 Although they interchange, the 1969 and 1970 standard steering wheels used different horn shrouds. 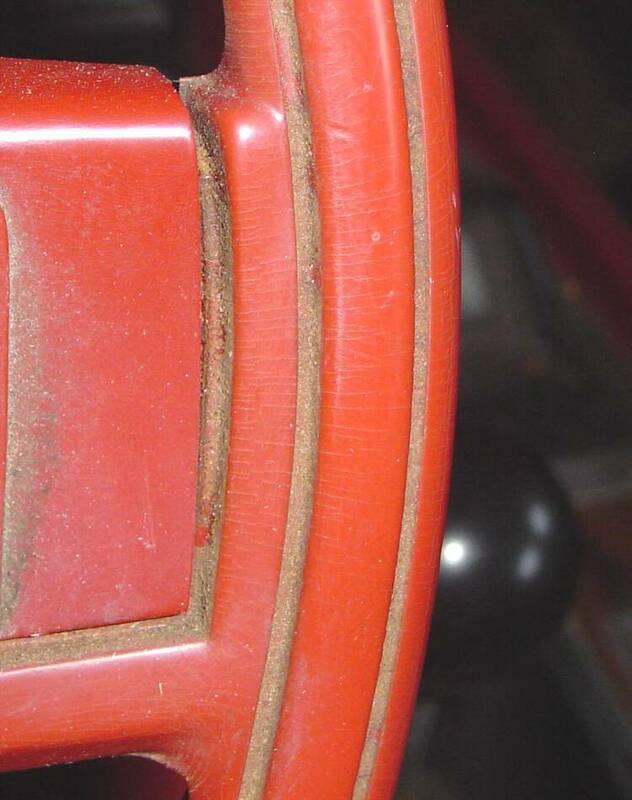 The 1969 was pebble-grained while the 1970 had a leather grained (also known as "camera case") finish. 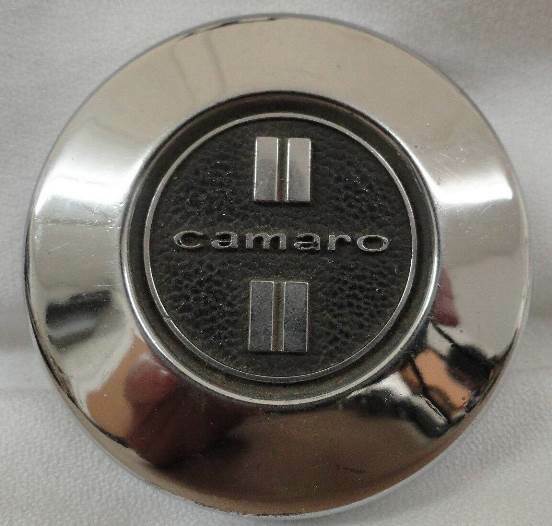 As this was the only service replacement from Chevrolet for a very long time, the leather grained (camera case) shroud is now found in many 1969 Camaros. It is incorrect. The 1970 Chevrolet Monte Carlo came with a burl wood horn shroud. 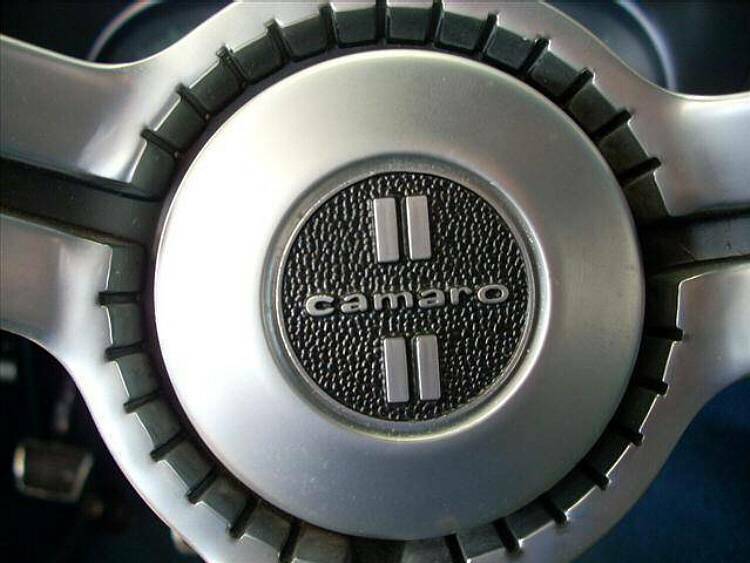 Although this shroud will also interchange with the 1969 Camaro, it would again be incorrect. 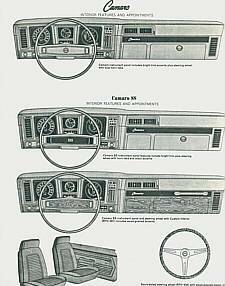 The charts below show the original part numbers for the steering wheel, shroud, hub, horn button, etc. for each year. 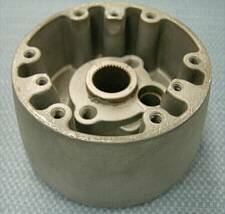 Not all wheels will show a shroud or hub as these parts were only required with certain wheels. 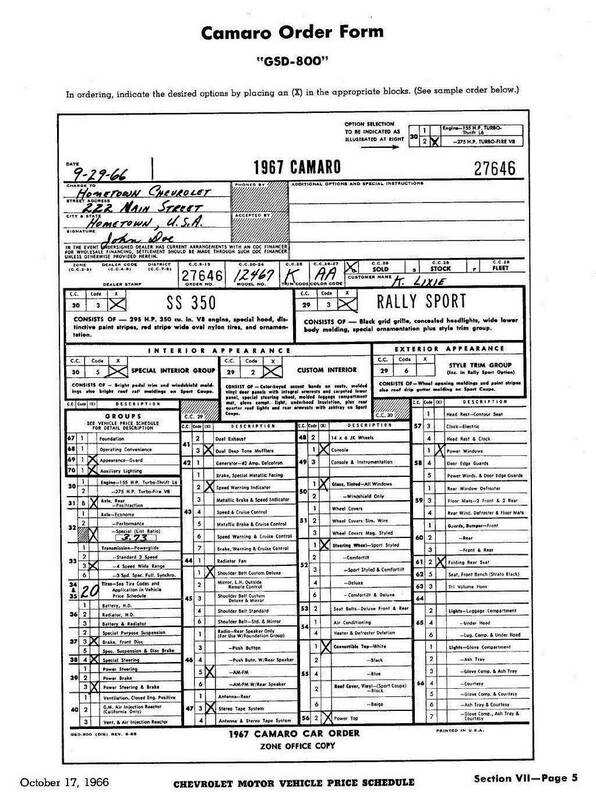 Note that these part numbers have probably been superseded several times over the years. 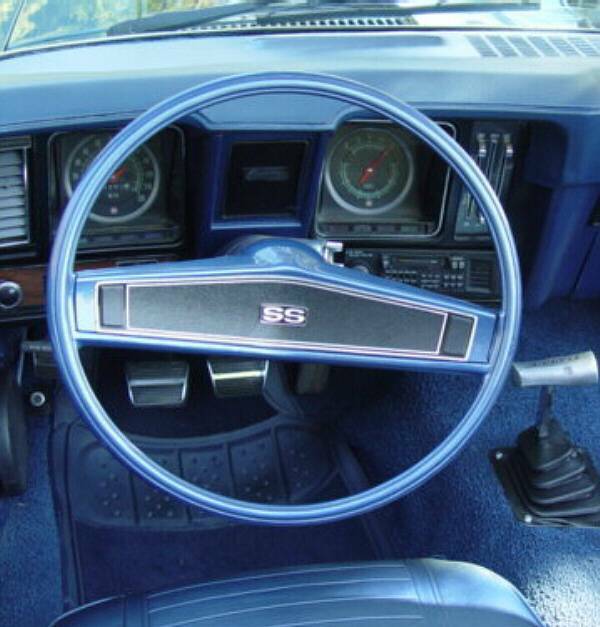 Visit the Interior Trim Codes page for a complete list of first generation Camaro interior codes and colors. 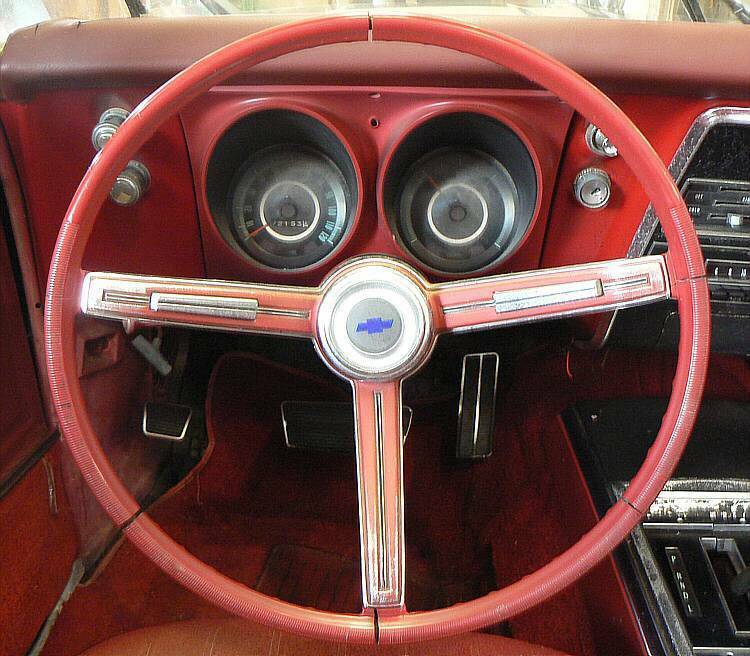 Note that the parts manuals are contradictory on the base 69 steering wheel. 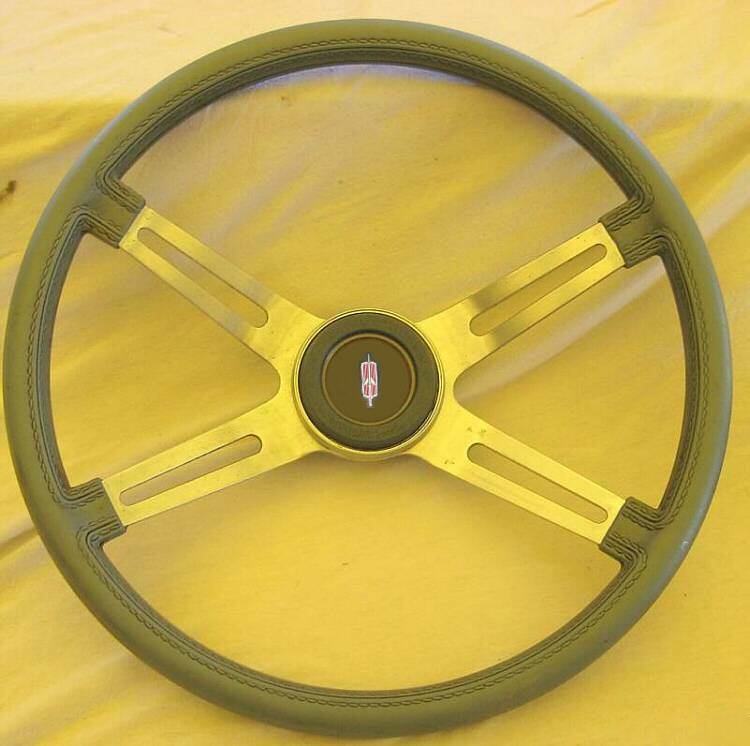 Some manuals list the never-released deluxe wheel; none list all the shrouds correctly. 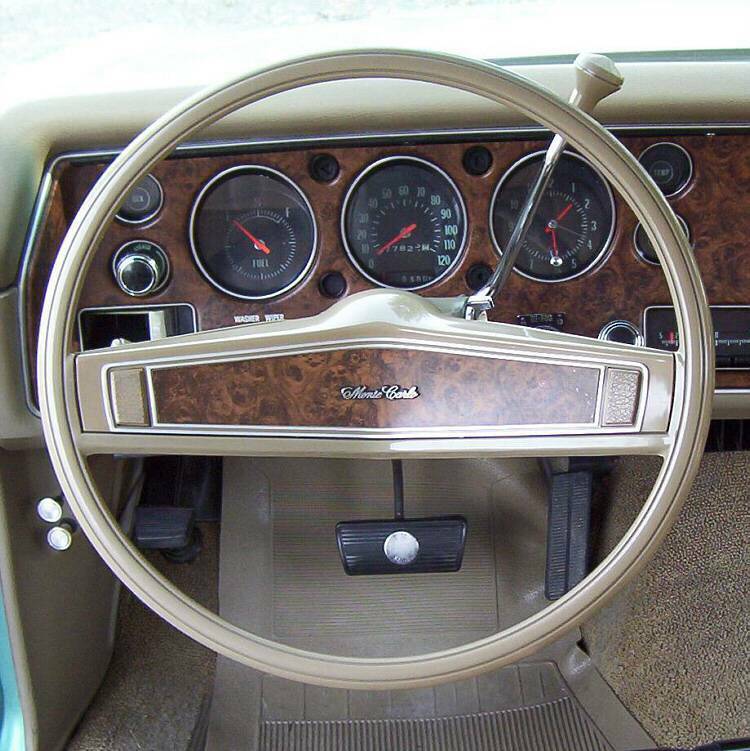 2 Although the horn caps for the 1967-1969 N34 wood-grained steering wheel have different part numbers, they all interchange with only unknown minor differences in design. 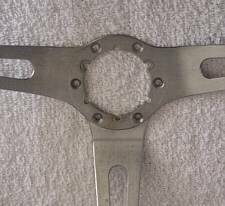 The appearance of all three part numbers is similar and any of the three can be used on the N34 wheel. 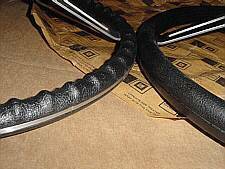 Original N34 horn caps will have pebble-graining in the black area, while most reproduction horn caps will have this area as flat black. Trim Parts is the only manufacturer currently reproducing the wood wheel horn cap with the correct pebble-graining in the center section. 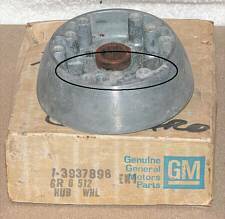 3 The 3901313 horn cap was used until May 1968. The 3923667 superseded the 3901313 horn cap and was used from May 1968 until the start of the 1969 model year. 4 This shroud had a note "Paint to match" and thus was intended as a service replacement in 1969 for all models and all colors. 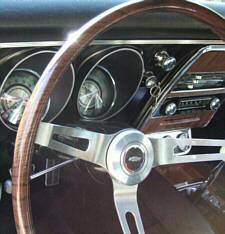 For use on cars w/o Z23 or Z87, the rosewood insert would need to be removed before installing. 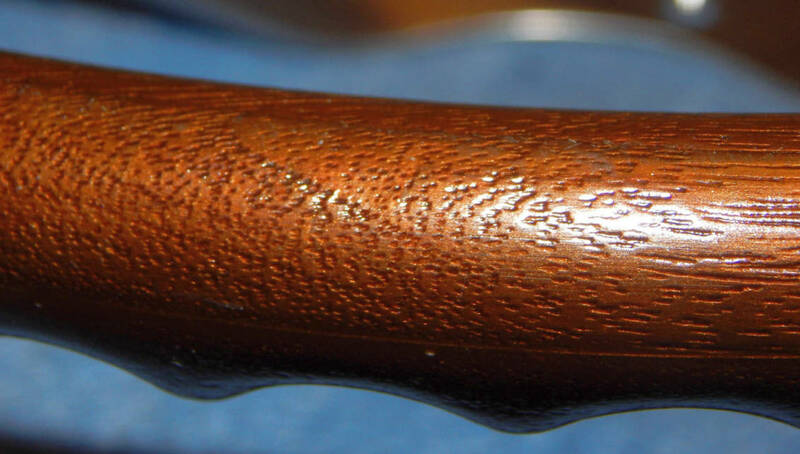 Note that this part number was replaced in 1970 by 3972735, but now consisted of the rosewood accent laminated over a leather-grain shroud instead of the original 1969 pebble-grain shroud. 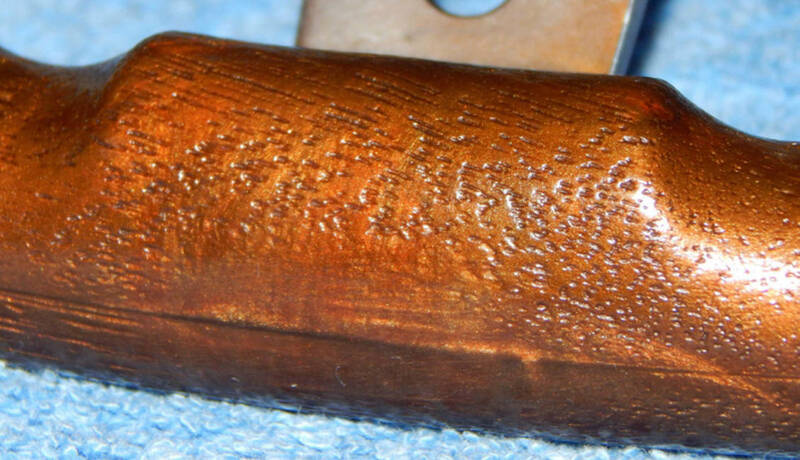 5 These are 1970 service replacement part numbers and consisted of the rosewood applique laminated over a leather-grain shroud instead of the original 1969 pebble-grain shroud.